Gender. Transgender. Non-binary. Transition. The gender revolution is here, bombarding our children with confusing messages about who they are—and creating heartache and concern for parents. What does it all mean? Is it influencing your child? Why are so many children “coming out” as trans or non-binary? Should you be worried? How should a Catholic respond? What should you tell your child? Come hear a dynamic presentation on the gender agenda – its impact on our language, relationships, faith, and self-understanding – and the Church’s response. 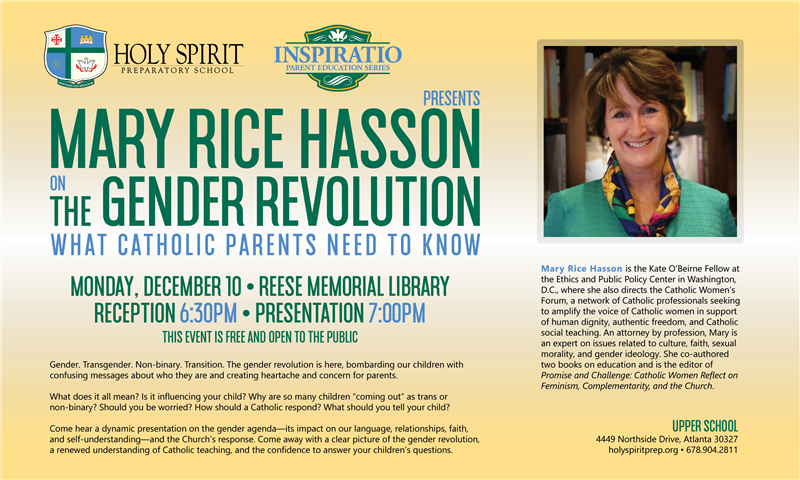 Come away with a clear picture of the gender revolution, a renewed understanding of Catholic teaching, and the confidence to answer your children’s questions. Mary Rice Hasson is the Kate O’Beirne Fellow at the Ethics and Public Policy Center in Washington, D.C., where she also directs the Catholic Women’s Forum, a network of Catholic professionals seeking to amplify the voice of Catholic women in support of human dignity, authentic freedom, and Catholic social teaching. Mary was the keynote speaker for the Holy See during the United Nations Commission on the Status of Women in both 2017 and 2018. An attorney by profession, Mary is an expert on issues related to culture, faith, sexual morality, and gender ideology. She speaks frequently on these topics at national conferences, diocesan workshops, and on college campuses, and her writing appears in various scholarly publications, policy journals, and websites. Mary is also a frequent commentator in international and U.S. media on issues pertaining to the Catholic Church. She co-authored two books on education and is the editor of Promise and Challenge: Catholic Women Reflect on Feminism, Complementarity, and the Church. Before joining EPPC, Mary worked as an attorney and writer and served the Church for over twenty years in leadership positions in Catholic marriage preparation, diocesan education efforts, and Catholic ministries to women and families. She is a graduate of the University of Notre Dame and the University of Notre Dame Law School. Mary and her husband, Kevin “Seamus” Hasson, are the parents of five sons and two daughters.